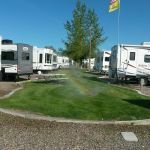 Ask fellow campers about "Double Dice RV Park" and nearby attractions. Semi-okay stay until the water main broke and there was no idea when it would be repaired. No apologies. We camped at Double Dice RV Park in a Fifth Wheel. Was ready to give this park a great rating - until 07:30, when the maintenance employee decided that running a lawn mower around my rig was a good idea. I went out and spoke with him - he was new and under orders to "get the place in shape for the owners who were going to inspect today". WOW! I asked if he could mow somewhere else until those of us that came in late the night before got going, but he was adamant that he must continue on his current path. Otherwise, the place was in good shape (well, except perhaps for the grass next to my rig I suppose, all of a couple of inches long.). No sites long enough for my 65', so they let me hang out into a dead-end driveway. The staff encountered, with exception of the aforementioned gentleman, were outstanding and helpful. There was a Bar and Grill on-site with standard grill fare that was good. We camped at Double Dice RV Park in a Motorhome. Plenty of room to navigate in park even at 65'. The Bar and Grill had slots for those that feel the need. Easy overnight park right off interstate. Big rig friendly. We did not disconnect tow car, stuck out a little bit, but park wasn't very busy. It's mid October and cold. Didn't hear a thing outside. Sites are wide, with table. Full hook up with 50 amp service. Good cell service here. We camped at Double Dice RV Park in a Motorhome. Thank you for taking the time to leave us a review! We appreciate all feedback! Hope you enjoyed your stay! Come back and visit soon! Easy access off I-80. Sites nicely spaced and well maintained. Ours had a grassy area with table and grill. Restrooms are very clean. Food from the Bar and Grill was good. Staff very pleasant to deal with. We camped at Double Dice RV Park in a Motorhome. Thank you so much for taking the time to rate and review us! We hope to see you soon! Nice one-nighter, easy access to freeway, fairly quiet at night. Cute little bar with some slots. Gravel, level, full hookups. Ok cable, wifi wouldn't carry much, cell signal weak too so no hotspot. Clean and safe.. We camped at Double Dice RV Park in a Motorhome. Nothing going on in this town, but there isn't much else between Tahoe and Salt Lake City. For taking the time to review and rate us, We value all feedback! We hope you enjoyed your stay and wish to see you back soon! Stayed one night. Very spacious spaces for rv with grass. Laundry and restrooms were clean. Slight downside is railroad about 500 yds away. Whistle blew at 6:30 am. Convenient location to everything in Elko. We camped at Double Dice RV Park in a Fifth Wheel. Thank you Joyce for taking the time to rate and review us, We love feedback, Hope to see back soon! Good park. Small restaurant/bar. Gravel pad with grass at each site w/ picnic table. Wide roads for easy in and out. No need to unhook. Easy on and off freeway. We camped at Double Dice RV Park in a Travel Trailer. Thank you for taking time to rate and review us, We love feedback. Hope to see you back again! One of the nicest RV Parks I have stayed in. Recently remodeled and updated. Vastly improved over past reviews. Took out every other space and put in gold course type grass. Absolutely beautiful. Food at the bar was excellent! Very friendly staff. We camped at Double Dice RV Park in a Travel Trailer. Thank You so much B52crewdog, We are so glad you enjoyed your stay, also for taking the time to rate and review us we love feedback!! Come back soon! This place had a major upgrade since we stayed here last time. Every transient site has a patch of grass and a picnic table. Not much amenity and the wifi is useless when the park is busy. We relied on our T-Mobile which had good reception. I feel the price is a bit high for not much amenity but the place is very maintained. We camped at Double Dice RV Park in a Fifth Wheel. Make sure to have your levelers with you as you will need them. For rating us an giving us a review, We are sorry for the WiFi issue, we will work on it, hope to see you back soon!! Nicely kept and convenient park. Our spot had grass, shade, and a picnic table. Pet friendly. Would stay here again. We camped at Double Dice RV Park in a Motorhome. Thank you MarianB, for rating us and giving us a very nice review.. We hope to see you back soon! Camped here and visited with friends. This park is all gravel and sets against the Humbolt River. There is a very active train in the drop off towards the river.... BUT I LOVE TRAINS, so the whistles did not bother me. They are improving this park with grassy areas at some sites (upgrade). Dog park is a gravel area only, no enclosure. We camped at Double Dice RV Park in a Truck Camper. The check-in process was the quickest of any RV park we've been to. It pays to make reservation at this park as all the pertinent information was printed on the registration when we check-in. A lot of construction going on very early in the morning. We were told we will lose power in 10 minutes and that got us moving very quickly. We will stay here again and look forward to checking out all the improvements they are making to the property. We camped at Double Dice RV Park in a Fifth Wheel. The sites are very close together. Evidently they are making every other site a grass space between sites. Unfortunately, they started working a 6 am! Thankfully, we had planned on an early start - not quite that early! Laundry facility was clean with plenty of washers and dryers. $1.75 per wash and $0.25 for 6 minutes drying. Site is only gravel with no shade. Hopefully the remodeling of sites will include addition of trees. We camped at Double Dice RV Park in a Motorhome. Stayed one night. Pull-through, level, gravel, full hookup. Train noise and coming and goings. Nice friendly service and clean. Dog walk in back with bags provided. Restaurant, RV supplies. I am not sure I would come back. We camped at Double Dice RV Park in a Travel Trailer. Little bit tight getting into the sites. Otherwise a pleasant place. We camped at Double Dice RV Park in a Travel Trailer. Eat inside the bar...you won't be sorry!! First weekend in July is the International Basque Festival, very interesting. Museum in town good. We do not gamble. Went hiking in the mountains outside of town. Great. Are you affiliated with Double Dice RV Park ?